Proprietary Name: Verzenio What is the Proprietary Name? Non-Proprietary Name: Abemaciclib What is the Non-Proprietary Name? Verzenio with NDC 0002-4815 is a a human prescription drug product labeled by Eli Lilly And Company. The generic name of Verzenio is abemaciclib. The product's dosage form is tablet and is administered via oral form. FDA Application Number: NDA208716 What is the FDA Application Number? Start Marketing Date: 09-28-2017 What is the Start Marketing Date? In combination with an aromatase inhibitor as initial endocrine-based therapy for the treatment of postmenopausal women with hormone receptor (HR)-positive, human epidermal growth factor receptor 2 (HER2)-negative advanced or metastatic breast cancer. 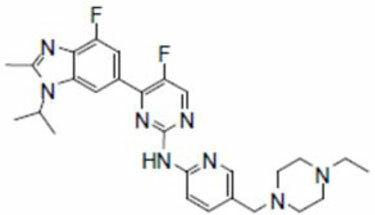 In combination with fulvestrant for the treatment of women with hormone receptor (HR)-positive, human epidermal growth factor receptor 2 (HER2)-negative advanced or metastatic breast cancer with disease progression following endocrine therapy. As monotherapy for the treatment of adult patients with HR-positive, HER2-negative advanced or metastatic breast cancer with disease progression following endocrine therapy and prior chemotherapy in the metastatic setting. Continue treatment until disease progression or unacceptable toxicity. VERZENIO may be taken with or without food [see Clinical Pharmacology (12.3)]. Instruct patients to take their doses of VERZENIO at approximately the same times every day. Dose Modifications for Adverse ReactionsThe recommended VERZENIO dose modifications for adverse reactions are provided in Tables 1-5. Discontinue VERZENIO for patients unable to tolerate 50 mg twice daily. Table 2: VERZENIO Dose Modification and Management — Hematologic ToxicitiesaAbbreviation: CTCAE = Common Terminology Criteria for Adverse Events. a If blood cell growth factors are required, suspend VERZENIO dose for at least 48 hours after the last dose of blood cell growth factor and until toxicity resolves to ≤Grade 2. Resume at next lower dose unless already performed for the toxicity that led to the use of the growth factor. Growth factor use as per current treatment guidelines. No dose modification is required. Suspend dose until toxicity resolves to ≤Grade 2.Dose reduction is not required. Suspend dose until toxicity resolves to ≤Grade 2.Resume at next lower dose. At the first sign of loose stools, start treatment with antidiarrheal agents and increase intake of oral fluids. If toxicity does not resolve within 24 hours to ≤Grade 1, suspend dose until resolution. No dose reduction is required. Suspend dose until toxicity resolves to ≤Grade 1.Resume at next lower dose. Abbreviations: ALT = alanine aminotransferase, AST = aspartate aminotransferase, ULN = upper limit of normal. Monitor ALT, AST, and serum bilirubin prior to the start of VERZENIO therapy, every 2 weeks for the first 2 months, monthly for the next 2 months, and as clinically indicated. Suspend dose until toxicity resolves to baseline or Grade 1.Resume at next lower dose. Table 5: VERZENIO Dose Modification and Management for Other Toxicitiesaa Excluding diarrhea, hematologic toxicity, and hepatotoxicity. Suspend dose until toxicity resolves to baseline or ≤Grade 1.Resume at next lower dose. Refer to the Full Prescribing Information for coadministered aromatase inhibitor or fulvestrant for dose modifications and other relevant safety information. Dose Modification for Use with Strong CYP3A InhibitorsAvoid concomitant use of the strong CYP3A inhibitor ketoconazole. With concomitant use of other strong CYP3A inhibitors, in patients with recommended starting doses of 200 mg twice daily or 150 mg twice daily, reduce the VERZENIO dose to 100 mg twice daily. In patients who have had a dose reduction to 100 mg twice daily due to adverse reactions, further reduce the VERZENIO dose to 50 mg twice daily. If a patient taking VERZENIO discontinues a strong CYP3A inhibitor, increase the VERZENIO dose (after 3-5 half-lives of the inhibitor) to the dose that was used before starting the strong inhibitor [see Drug Interactions (7.1) and Clinical Pharmacology (12.3)]. Dose Modification for Patients with Severe Hepatic ImpairmentFor patients with severe hepatic impairment (Child Pugh-C), reduce the VERZENIO dosing frequency to once daily [see Use in Specific Populations (8.7) and Clinical Pharmacology (12.3)]. Refer to the Full Prescribing Information for coadministered aromatase inhibitor or fulvestrant for dose modification requirements for severe hepatic impairment. Postmenopausal Women with HR-positive, HER2-negative locoregionally recurrent or metastatic breast cancer with no prior systemic therapy in this disease settingMONARCH 3 was a study of 488 women receiving VERZENIO plus an aromatase inhibitor or placebo plus an aromatase inhibitor. Patients were randomly assigned to receive 150 mg of VERZENIO or placebo orally twice daily, plus physician's choice of anastrozole or letrozole once daily. Median duration of treatment was 15.1 months for the VERZENIO arm and 13.9 months for the placebo arm. Median dose compliance was 98% for the VERZENIO arm and 99% for the placebo arm. Dose reductions due to an adverse reaction occurred in 43% of patients receiving VERZENIO plus anastrozole or letrozole. Adverse reactions leading to dose reductions in ≥5% of patients were diarrhea and neutropenia. VERZENIO dose reductions due to diarrhea of any grade occurred in 13% of patients receiving VERZENIO plus an aromatase inhibitor compared to 2% of patients receiving placebo plus an aromatase inhibitor. VERZENIO dose reductions due to neutropenia of any grade occurred in 11% of patients receiving VERZENIO plus an aromatase inhibitor compared to 0.6% of patients receiving placebo plus an aromatase inhibitor. Permanent treatment discontinuation due to an adverse event was reported in 13% of patients receiving VERZENIO plus an aromatase inhibitor and in 3% placebo plus an aromatase inhibitor. Adverse reactions leading to permanent discontinuation for patients receiving VERZENIO plus an aromatase inhibitor were diarrhea (2%), ALT increased (2%), infection (1%), venous thromboembolic events (VTE) (1%), neutropenia (0.9%), renal impairment (0.9%), AST increased (0.6%), dyspnea (0.6%), pulmonary fibrosis (0.6%) and anemia, rash, weight decreased and thrombocytopenia (each 0.3%). Deaths during treatment or during the 30-day follow up, regardless of causality, were reported in 11 cases (3%) of VERZENIO plus an aromatase inhibitor treated patients versus 3 cases (2%) of placebo plus an aromatase inhibitor treated patients. Causes of death for patients receiving VERZENIO plus an aromatase inhibitor included: 3 (0.9%) patient deaths due to underlying disease, 3 (0.9%) due to lung infection, 3 (0.9%) due to VTE event, 1 (0.3%) due to pneumonitis, and 1 (0.3%) due to cerebral infarction. The most common adverse reactions reported (≥20%) in the VERZENIO arm and ≥2% than the placebo arm were diarrhea, neutropenia, fatigue, infections, nausea, abdominal pain, anemia, vomiting, alopecia, decreased appetite, and leukopenia (Table 6). The most frequently reported (≥5%) Grade 3 or 4 adverse reactions were neutropenia, diarrhea, leukopenia, increased ALT, and anemia. Diarrhea incidence was greatest during the first month of VERZENIO dosing. The median time to onset of the first diarrhea event was 8 days, and the median durations of diarrhea for Grades 2 and for Grade 3 were 11 days and 8 days, respectively. Most diarrhea events recovered or resolved (88%) with supportive treatment and/or dose reductions [see Dosage and Administration (2.2) and Patient Counseling Information (17)]. Nineteen percent of patients with diarrhea required a dose omission and 13% required a dose reduction. The median time to the first dose reduction due to diarrhea was 38 days. a Includes all reported preferred terms that are part of the Infections and Infestations system organ class. Most common infections (>1%) include upper respiratory tract infection, lung infection, and pharyngitis. Additional adverse reactions in MONARCH 3 include venous thromboembolic events (deep vein thrombosis, pulmonary embolism, and pelvic venous thrombosis), which were reported in 5% of patients treated with VERZENIO plus anastrozole or letrozole as compared to 0.6% of patients treated with anastrozole or letrozole plus placebo. Creatinine IncreasedAbemaciclib has been shown to increase serum creatinine due to inhibition of renal tubular secretion transporters, without affecting glomerular function [see Clinical Pharmacology (12.3)]. Across the clinical studies, increases in serum creatinine (mean increase, 0.2-0.3 mg/dL) occurred within the first 28-day cycle of VERZENIO dosing, remained elevated but stable through the treatment period, and were reversible upon treatment discontinuation. Alternative markers such as BUN, cystatin C, or calculated GFR, which are not based on creatinine, may be considered to determine whether renal function is impaired. Women with HR-positive, HER2-negative advanced or metastatic breast cancer with disease progression on or after prior adjuvant or metastatic endocrine therapyThe safety of VERZENIO (150 mg twice daily) plus fulvestrant (500 mg) versus placebo plus fulvestrant was evaluated in MONARCH 2. The data described below reflect exposure to VERZENIO in 441 patients with HR-positive, HER2-negative advanced breast cancer who received at least one dose of VERZENIO plus fulvestrant in MONARCH 2. Median duration of treatment was 12 months for patients receiving VERZENIO plus fulvestrant and 8 months for patients receiving placebo plus fulvestrant. Dose reductions due to an adverse reaction occurred in 43% of patients receiving VERZENIO plus fulvestrant. Adverse reactions leading to dose reductions in ≥5% of patients were diarrhea and neutropenia. VERZENIO dose reductions due to diarrhea of any grade occurred in 19% of patients receiving VERZENIO plus fulvestrant compared to 0.4% of patients receiving placebo and fulvestrant. VERZENIO dose reductions due to neutropenia of any grade occurred in 10% of patients receiving VERZENIO plus fulvestrant compared to no patients receiving placebo plus fulvestrant. Permanent study treatment discontinuation due to an adverse event were reported in 9% of patients receiving VERZENIO plus fulvestrant and in 3% of patients receiving placebo plus fulvestrant. Adverse reactions leading to permanent discontinuation for patients receiving VERZENIO plus fulvestrant were infection (2%), diarrhea (1%), hepatotoxicity (1%), fatigue (0.7%), nausea (0.2%), abdominal pain (0.2%), acute kidney injury (0.2%), and cerebral infarction (0.2%). Deaths during treatment or during the 30-day follow up, regardless of causality, were reported in 18 cases (4%) of VERZENIO plus fulvestrant treated patients versus 10 cases (5%) of placebo plus fulvestrant treated patients. Causes of death for patients receiving VERZENIO plus fulvestrant included: 7 (2%) patient deaths due to underlying disease, 4 (0.9%) due to sepsis, 2 (0.5%) due to pneumonitis, 2 (0.5%) due to hepatotoxicity, and one (0.2%) due to cerebral infarction. The most common adverse reactions reported (≥20%) in the VERZENIO arm were diarrhea, fatigue, neutropenia, nausea, infections, abdominal pain, anemia, leukopenia, decreased appetite, vomiting, and headache (Table 8). The most frequently reported (≥5%) Grade 3 or 4 adverse reactions were neutropenia, diarrhea, leukopenia, anemia, and infections. a Includes abdominal pain, abdominal pain upper, abdominal pain lower, abdominal discomfort, abdominal tenderness. b Includes upper respiratory tract infection, urinary tract infection, lung infection, pharyngitis, conjunctivitis, sinusitis, vaginal infection, sepsis. c Includes neutropenia, neutrophil count decreased. d Includes anemia, hematocrit decreased, hemoglobin decreased, red blood cell count decreased. e Includes leukopenia, white blood cell count decreased. f Includes platelet count decreased, thrombocytopenia. Additional adverse reactions in MONARCH 2 include venous thromboembolic events (deep vein thrombosis, pulmonary embolism, cerebral venous sinus thrombosis, subclavian vein thrombosis, axillary vein thrombosis, and DVT inferior vena cava), which were reported in 5% of patients treated with VERZENIO plus fulvestrant as compared to 0.9% of patients treated with fulvestrant plus placebo. Creatinine IncreasedAbemaciclib has been shown to increase serum creatinine due to inhibition of renal tubular secretion transporters, without affecting glomerular function [see Clinical Pharmacology (12.3)]. In clinical studies, increases in serum creatinine (mean increase, 0.2-0.3 mg/dL) occurred within the first 28-day cycle of VERZENIO dosing, remained elevated but stable through the treatment period, and were reversible upon treatment discontinuation. Alternative markers such as BUN, cystatin C, or calculated glomerular filtration rate (GFR), which are not based on creatinine, may be considered to determine whether renal function is impaired. Patients with HR-positive, HER2-negative breast cancer who received prior endocrine therapy and 1-2 chemotherapy regimens in the metastatic settingSafety data below are based on MONARCH 1, a single-arm, open-label, multicenter study in 132 women with measurable HR-positive, HER2-negative metastatic breast cancer. Patients received 200 mg VERZENIO orally twice daily until development of progressive disease or unmanageable toxicity. Median duration of treatment was 4.5 months. Ten patients (8%) discontinued study treatment from adverse reactions due to (1 patient each) abdominal pain, arterial thrombosis, aspartate aminotransferase (AST) increased, blood creatinine increased, chronic kidney disease, diarrhea, ECG QT prolonged, fatigue, hip fracture, and lymphopenia. Forty-nine percent of patients had dose reductions due to an adverse reaction. The most frequent adverse reactions that led to dose reductions were diarrhea (20%), neutropenia (11%), and fatigue (9%). Deaths during treatment or during the 30-day follow up were reported in 2% of patients. Cause of death in these patients was due to infection. The most common reported adverse reactions (≥20%) were diarrhea, fatigue, nausea, decreased appetite, abdominal pain, neutropenia, vomiting, infections, anemia, headache, and thrombocytopenia (Table 10). Severe (Grade 3 and 4) neutropenia was observed in patients receiving abemaciclib [see Dosage and Administration (2.2)]. b Includes neutropenia, neutrophil count decreased. c Includes anemia, hematocrit decreased, hemoglobin decreased, red blood cell count decreased. d Includes platelet count decreased, thrombocytopenia. Creatinine IncreasedAbemaciclib has been shown to increase serum creatinine due to inhibition of renal tubular secretion transporters, without affecting glomerular function [see Clinical Pharmacology (12.3)]. In clinical studies, increases in serum creatinine (mean increase, 0.2-0.3 mg/dL) occurred within the first 28-day cycle of VERZENIO dosing, remained elevated but stable through the treatment period, and were reversible upon treatment discontinuation. Alternative markers such as BUN, cystatin C, or calculated GFR, which are not based on creatinine, may be considered to determine whether renal function is impaired. Strong CYP3A InhibitorsStrong CYP3A4 inhibitors increased the exposure of abemaciclib plus its active metabolites to a clinically meaningful extent and may lead to increased toxicity. KetoconazoleAvoid concomitant use of ketoconazole. Ketoconazole is predicted to increase the AUC of abemaciclib by up to 16-fold [see Clinical Pharmacology (12.3)]. Dosage and Administration (2.2) and Clinical Pharmacology (12.3)]. Strong CYP3A InducersCoadministration of VERZENIO with rifampin, a strong CYP3A inducer, decreased the plasma concentrations of abemaciclib plus its active metabolites and may lead to reduced activity. Avoid concomitant use of strong CYP3A inducers and consider alternative agents [see Clinical Pharmacology (12.3)]. Data). Advise pregnant women of the potential risk to a fetus. Animal DataIn an embryo-fetal development study, pregnant rats received oral doses of abemaciclib up to 15 mg/kg/day during the period of organogenesis. Doses ≥4 mg/kg/day caused decreased fetal body weights and increased incidence of cardiovascular and skeletal malformations and variations. These findings included absent innominate artery and aortic arch, malpositioned subclavian artery, unossified sternebra, bipartite ossification of thoracic centrum, and rudimentary or nodulated ribs. At 4 mg/kg/day in rats, the maternal systemic exposures were approximately equal to the human exposure (AUC) at the recommended dose. Risk SummaryThere are no data on the presence of abemaciclib in human milk, or its effects on the breastfed child or on milk production. Because of the potential for serious adverse reactions in breastfed infants from VERZENIO, advise lactating women not to breastfeed during VERZENIO treatment and for at least 3 weeks after the last dose. Pregnancy TestingBased on animal studies, VERZENIO can cause fetal harm when administered to a pregnant woman [see Use in Specific Populations (8.1)]. Pregnancy testing is recommended for females of reproductive potential prior to initiating treatment with VERZENIO. FemalesVERZENIO can cause fetal harm when administered to a pregnant woman [see Use in Specific Populations (8.1)]. Advise females of reproductive potential to use effective contraception during VERZENIO treatment and for at least 3 weeks after the last dose. MalesBased on findings in animals, VERZENIO may impair fertility in males of reproductive potential [see Nonclinical Toxicology (13.1)]. Cardiac ElectrophysiologyBased on evaluation of the QTc interval in patients and in a healthy volunteer study, abemaciclib did not cause large mean increases (i.e., 20 ms) in the QTc interval. AbsorptionThe absolute bioavailability of abemaciclib after a single oral dose of 200 mg is 45% (19% CV). The median Tmax of abemaciclib is 8.0 hours (range: 4.1-24.0 hours). Effect of FoodA high-fat, high-calorie meal (approximately 800 to 1000 calories with 150 calories from protein, 250 calories from carbohydrate, and 500 to 600 calories from fat) administered to healthy subjects increased the AUC of abemaciclib plus its active metabolites by 9% and increased Cmax by 26%. DistributionIn vitro, abemaciclib was bound to human plasma proteins, serum albumin, and alpha-1-acid glycoprotein in a concentration independent manner from 152 ng/mL to 5066 ng/mL. In a clinical study, the mean (standard deviation, SD) bound fraction was 96.3% (1.1) for abemaciclib, 93.4% (1.3) for M2, 96.8% (0.8) for M18, and 97.8% (0.6) for M20. The geometric mean systemic volume of distribution is approximately 690.3 L (49% CV). In patients with advanced cancer, including breast cancer, concentrations of abemaciclib and its active metabolites M2 and M20 in cerebrospinal fluid are comparable to unbound plasma concentrations. EliminationThe geometric mean hepatic clearance (CL) of abemaciclib in patients was 26.0 L/h (51% CV), and the mean plasma elimination half-life for abemaciclib in patients was 18.3 hours (72% CV). MetabolismHepatic metabolism is the main route of clearance for abemaciclib. Abemaciclib is metabolized to several metabolites primarily by cytochrome P450 (CYP) 3A4, with formation of N-desethylabemaciclib (M2) representing the major metabolism pathway. Additional metabolites include hydroxyabemaciclib (M20), hydroxy-N-desethylabemaciclib (M18), and an oxidative metabolite (M1). M2, M18, and M20 are equipotent to abemaciclib and their AUCs accounted for 25%, 13%, and 26% of the total circulating analytes in plasma, respectively. ExcretionAfter a single 150 mg oral dose of radiolabeled abemaciclib, approximately 81% of the dose was recovered in feces and approximately 3% recovered in urine. The majority of the dose eliminated in feces was metabolites. Age, Gender, and Body WeightBased on a population pharmacokinetic analysis in patients with cancer, age (range 24-91 years), gender (134 males and 856 females), and body weight (range 36-175 kg) had no effect on the exposure of abemaciclib. Patients with Renal ImpairmentIn a population pharmacokinetic analysis of 990 individuals, in which 381 individuals had mild renal impairment (60 mL/min ≤ CLcr <90 mL/min) and 126 individuals had moderate renal impairment (30 mL/min ≤ CLcr <60 mL/min), mild and moderate renal impairment had no effect on the exposure of abemaciclib [see Use in Specific Populations (8.6)]. The effect of severe renal impairment (CLcr <30 mL/min) on pharmacokinetics of abemaciclib is unknown. Patients with Hepatic ImpairmentFollowing a single 200 mg oral dose of abemaciclib, the relative potency adjusted unbound AUC0-INF of abemaciclib plus its active metabolites (M2, M18, M20) in plasma increased 1.2-fold in subjects with mild hepatic impairment (Child-Pugh A, n=9), 1.1-fold in subjects with moderate hepatic impairment (Child-Pugh B, n=10), and 2.4-fold in subjects with severe hepatic impairment (Child-Pugh C, n=6) relative to subjects with normal hepatic function (n=10) [see Use in Specific Populations (8.7)]. In subjects with severe hepatic impairment, the mean plasma elimination half-life of abemaciclib increased to 55 hours compared to 24 hours in subjects with normal hepatic function. Strong CYP3A Inhibitors: Ketoconazole (a strong CYP3A inhibitor) is predicted to increase the AUC of abemaciclib by up to 16-fold. Itraconazole (a strong CYP3A inhibitor) is predicted to increase the relative potency adjusted unbound AUC of abemaciclib plus its active metabolites (M2, M18 and M20) by 2.2-fold. Coadministration of 500 mg twice daily doses of clarithromycin (a strong CYP3A inhibitor) with a single 50 mg dose of VERZENIO (0.3 times the approved recommended 150 mg dosage) increased the relative potency adjusted unbound AUC0-INF of abemaciclib plus its active metabolites (M2, M18, and M20) by 1.7-fold relative to abemaciclib alone in cancer patients. Moderate CYP3A Inhibitors: Diltiazem and verapamil (moderate CYP3A inhibitors) are predicted to increase the relative potency adjusted unbound AUC of abemaciclib plus its active metabolites (M2, M18, and M20) by 1.7-fold and 1.3-fold, respectively. Strong CYP3A Inducers: Coadministration of 600 mg daily doses of rifampin (a strong CYP3A inducer) with a single 200 mg dose of VERZENIO decreased the relative potency adjusted unbound AUC0-INF of abemaciclib plus its active metabolites (M2, M18, and M20) by 67% in healthy subjects. Moderate CYP3A Inducers: The effect of moderate CYP3A inducers on the pharmacokinetics of abemaciclib is unknown. Loperamide: Co-administration of a single 8 mg dose of loperamide with a single 400 mg dose of abemaciclib in healthy subjects increased the relative potency adjusted unbound AUC0-INF of abemaciclib plus its active metabolites (M2 and M20) by 12%, which is not considered clinically relevant. Endocrine Therapies: In clinical studies in patients with breast cancer, there was no clinically relevant effect of fulvestrant, anastrozole, letrozole, or exemestane on abemaciclib pharmacokinetics. Loperamide: In a clinical drug interaction study in healthy subjects, coadministration of a single 8 mg dose of loperamide with a single 400 mg abemaciclib (2.7 times the approved recommended 150 mg dosage) increased loperamide AUC0-INF by 9% and Cmax by 35% relative to loperamide alone. These increases in loperamide exposure are not considered clinically relevant. Metformin: In a clinical drug interaction study in healthy subjects, coadministration of a single 1000 mg dose of metformin, a clinically relevant substrate of renal OCT2, MATE1, and MATE2-K transporters, with a single 400 mg dose of abemaciclib (2.7 times the approved recommended 150 mg dosage) increased metformin AUC0-INF by 37% and Cmax by 22% relative to metformin alone. Abemaciclib reduced the renal clearance and renal secretion of metformin by 45% and 62%, respectively, relative to metformin alone, without any effect on glomerular filtration rate (GFR) as measured by iohexol clearance and serum cystatin C.
Endocrine Therapies: In clinical studies in patients with breast cancer, there was no clinically relevant effect of abemaciclib on the pharmacokinetics of fulvestrant, anastrozole, letrozole, or exemestane. Transporter Systems: Abemaciclib and its major active metabolites inhibit the renal transporters OCT2, MATE1, and MATE2-K at concentrations achievable at the approved recommended dosage. The observed serum creatinine increase in clinical studies with abemaciclib is likely due to inhibition of tubular secretion of creatinine via OCT2, MATE1, and MATE2-K [see Adverse Effects (6.1)]. Abemaciclib and its major metabolites at clinically relevant concentrations do not inhibit the hepatic uptake transporters OCT1, OATP1B1, and OATP1B3 or the renal uptake transporters OAT1 and OAT3. Abemaciclib is a substrate of P-gp and BCRP. Abemaciclib and its major active metabolites, M2 and M20, are not substrates of hepatic uptake transporters OCT1, organic anion transporting polypeptide 1B1 (OATP1B1), or OATP1B3. Abemaciclib inhibits P-gp and BCRP. The clinical consequences of this finding on sensitive P-gp and BCRP substrates are unknown. CYP Metabolic Pathways: Abemaciclib and its major active metabolites, M2 and M20, do not induce CYP1A2, CYP2B6, or CYP3A at clinically relevant concentrations. Abemaciclib and its major active metabolites, M2 and M20, down regulate mRNA of CYPs, including CYP1A2, CYP2B6, CYP2C8, CYP2C9, CYP2D6 and CYP3A4. The mechanism of this down regulation and its clinical relevance are not understood. However, abemaciclib is a substrate of CYP3A4, and time-dependent changes in pharmacokinetics of abemaciclib as a result of autoinhibition of its metabolism was not observed. P-gp and BCRP Inhibitors: In vitro, abemaciclib is a substrate of P-gp and BCRP. The effect of P-gp or BCRP inhibitors on the pharmacokinetics of abemaciclib has not been studied. Postmenopausal women with HR-positive, HER2-negative advanced or metastatic breast cancer with no prior systemic therapy in this disease settingMONARCH 3 was a randomized (2:1), double-blinded, placebo-controlled, multicenter study in postmenopausal women with HR-positive, HER2-negative advanced or metastatic breast cancer in combination with a nonsteroidal aromatase inhibitor as initial endocrine-based therapy, including patients not previously treated with systemic therapy for breast cancer. Randomization was stratified by disease site (visceral, bone only, or other) and by prior (neo)adjuvant endocrine therapy (aromatase inhibitor versus other versus no prior endocrine therapy). A total of 493 patients were randomized to receive 150 mg VERZENIO or placebo orally twice daily, plus physician's choice of letrozole (80% of patients) or anastrozole (20% of patients). Patient median age was 63 years (range, 32-88 years) and the majority were White (58%) or Asian (30%). A total of 51% had received prior systemic therapy and 39% of patients had received chemotherapy, 53% had visceral disease, and 22% had bone-only disease. Efficacy results are summarized in Table 12 and Figure 1. PFS was evaluated according to RECIST version 1.1 and PFS assessment based on a blinded independent radiologic review was consistent with the investigator assessment. Consistent results were observed across patient stratification subgroups of disease site and prior (neo)adjuvant endocrine therapy. At the time of the PFS analysis, 19% of patients had died, and overall survival data were immature. Abbreviations: CI = confidence interval, NR = not reached. a Complete response + partial response. b Based upon confirmed responses. Patients with HR-positive, HER2-negative advanced or metastatic breast cancer with disease progression on or after prior adjuvant or metastatic endocrine therapyMONARCH 2 (NCT02107703) was a randomized, placebo-controlled, multicenter study in women with HR-positive, HER2-negative metastatic breast cancer in combination with fulvestrant in patients with disease progression following endocrine therapy who had not received chemotherapy in the metastatic setting. Randomization was stratified by disease site (visceral, bone only, or other) and by sensitivity to prior endocrine therapy (primary or secondary resistance). Primary endocrine therapy resistance was defined as relapse while on the first 2 years of adjuvant endocrine therapy or progressive disease within the first 6 months of first line endocrine therapy for metastatic breast cancer. A total of 669 patients were randomized to receive VERZENIO or placebo orally twice daily plus intramuscular injection of 500 mg fulvestrant on days 1 and 15 of cycle 1 and then on day 1 of cycle 2 and beyond (28-day cycles). Pre/perimenopausal women were enrolled in the study and received the gonadotropin-releasing hormone agonist goserelin for at least 4 weeks prior to and for the duration of MONARCH 2. Patients remained on continuous treatment until development of progressive disease or unmanageable toxicity. Patient median age was 60 years (range, 32-91 years), and 37% of patients were older than 65. The majority were White (56%), and 99% of patients had an Eastern Cooperative Oncology Group (ECOG) performance status of 0 or 1. Twenty percent (20%) of patients had de novo metastatic disease, 27% had bone-only disease, and 56% had visceral disease. Twenty-five percent (25%) of patients had primary endocrine therapy resistance. Seventeen percent (17%) of patients were pre- or perimenopausal. The efficacy results from the MONARCH 2 study are summarized in Table 13 and Figure 2. Median PFS assessment based on a blinded independent radiologic review was consistent with the investigator assessment. Consistent results were observed across patient stratification subgroups of disease site and endocrine therapy resistance. At the time of primary analysis of PFS, overall survival data were not mature (20% of patients had died). Patients with HR-positive, HER2-negative breast cancer who received prior endocrine therapy and 1-2 chemotherapy regimens in the metastatic settingMONARCH 1 (NCT02102490) was a single-arm, open-label, multicenter study in women with measurable HR-positive, HER2-negative metastatic breast cancer whose disease progressed during or after endocrine therapy, had received a taxane in any setting, and who received 1 or 2 prior chemotherapy regimens in the metastatic setting. A total of 132 patients received 200 mg VERZENIO orally twice daily on a continuous schedule until development of progressive disease or unmanageable toxicity. Patient median age was 58 years (range, 36-89 years), and the majority of patients were White (85%). Patients had an Eastern Cooperative Oncology Group performance status of 0 (55% of patients) or 1 (45%). The median duration of metastatic disease was 27.6 months. Ninety percent (90%) of patients had visceral metastases, and 51% of patients had 3 or more sites of metastatic disease. Fifty-one percent (51%) of patients had had one line of chemotherapy in the metastatic setting. Sixty-nine percent (69%) of patients had received a taxane-based regimen in the metastatic setting and 55% had received capecitabine in the metastatic setting. Table 14 provides the efficacy results from MONARCH 1.
a All responses were partial responses. DiarrheaVERZENIO may cause diarrhea, which may be severe in some cases [see Warnings and Precautions (5.1)]. Early identification and intervention is critical for the optimal management of diarrhea. Instruct patients that at the first sign of loose stools, they should start antidiarrheal therapy (for example, loperamide) and notify their healthcare provider for further instructions and appropriate follow up. Encourage patients to increase oral fluids. If diarrhea does not resolve with antidiarrheal therapy within 24 hours to ≤Grade 1, suspend VERZENIO dosing [see Dosage and Administration (2.2)]. NeutropeniaAdvise patients of the possibility of developing neutropenia and to immediately contact their healthcare provider should they develop a fever, particularly in association with any signs of infection [see Warnings and Precautions (5.2)]. HepatotoxicityInform patients of the signs and symptoms of hepatotoxicity. Advise patients to contact their healthcare provider immediately for signs or symptoms of hepatotoxicity [see Warnings and Precautions (5.3)]. Venous ThromboembolismAdvise patients to immediately report any signs or symptoms of thromboembolism such as pain or swelling in an extremity, shortness of breath, chest pain, tachypnea, and tachycardia [see Warnings and Precautions (5.4)]. Embryo-Fetal ToxicityAdvise females of reproductive potential of the potential risk to a fetus and to use effective contraception during VERZENIO therapy and for at least 3 weeks after the last dose. Advise patients to inform their healthcare provider of a known or suspected pregnancy [see Warnings and Precautions (5.5) and Use in Specific Populations (8.1, 8.3)]. LactationAdvise lactating women not to breastfeed during VERZENIO treatment and for at least 3 weeks after the last dose [see Use in Specific Populations (8.2)]. Drug InteractionsInform patients to avoid concomitant use of ketoconazole. Dose reduction may be required for other strong CYP3A inhibitors [see Dosage and Administration (2.2) and Drug Interactions (7)]. Grapefruit may interact with VERZENIO. Advise patients not to consume grapefruit products while on treatment with VERZENIO. Advise patients to avoid concomitant use of CYP3A inducers and to consider alternative agents [see Dosage and Administration (2.2) and Drug Interactions (7)]. Advise patients to inform their healthcare providers of all concomitant medications, including prescription medicines, over-the-counter drugs, vitamins, and herbal products [see Dosage and Administration (2.2) and Drug Interactions (7)]. DosingInstruct patients to take the doses of VERZENIO at approximately the same times every day and to swallow whole (do not chew, crush, or split them prior to swallowing) [see Dosage and Administration (2.1)]. If patient vomits or misses a dose, advise the patient to take the next prescribed dose at the usual time [see Dosage and Administration (2.1)]. Advise the patient that VERZENIO may be taken with or without food [see Dosage and Administration (2.1)]. Marketed by: Lilly USA, LLC, Indianapolis, IN 46285, USACopyright © 2017, 2018, Eli Lilly and Company. All rights reserved. 50 mg tablets: oval beige tablet with “Lilly” debossed on one side and “50” on the other side. 100 mg tablets: oval white to practically white tablet with “Lilly” debossed on one side and “100” on the other side. 150 mg tablets: oval yellow tablet with “Lilly” debossed on one side and “150” on the other side. 200 mg tablets: oval beige tablet with “Lilly” debossed on one side and “200” on the other side. Diarrhea occurred in 81% of patients receiving VERZENIO plus an aromatase inhibitor in MONARCH 3, 86% of patients receiving VERZENIO plus fulvestrant in MONARCH 2, and 90% of patients receiving VERZENIO alone in MONARCH 1. Grade 3 diarrhea occurred in 9% of patients receiving VERZENIO plus an aromatase inhibitor in MONARCH 3, 13% of patients receiving VERZENIO plus fulvestrant in MONARCH 2, and in 20% of patients receiving VERZENIO alone in MONARCH 1. Episodes of diarrhea have been associated with dehydration and infection. Diarrhea incidence was greatest during the first month of VERZENIO dosing. In MONARCH 3, the median time to onset of the first diarrhea event was 8 days, and the median duration of diarrhea for Grades 2 and 3 were 11 and 8 days, respectively. In MONARCH 2, the median time to onset of the first diarrhea event was 6 days, and the median duration of diarrhea for Grades 2 and 3 were 9 days and 6 days, respectively [see Dosage and Administration (2.2) and Patient Counseling Information (17)]. In MONARCH 3, 19% of patients with diarrhea required a dose omission and 13% required a dose reduction. In MONARCH 2, 22% of patients with diarrhea required a dose omission and 22% required a dose reduction. The time to onset and resolution for diarrhea were similar across MONARCH 3, MONARCH 2, and MONARCH 1. Instruct patients that at the first sign of loose stools, they should start antidiarrheal therapy such as loperamide, increase oral fluids, and notify their healthcare provider for further instructions and appropriate follow up. For Grade 3 or 4 diarrhea, or diarrhea that requires hospitalization, discontinue VERZENIO until toxicity resolves to ≤Grade 1, and then resume VERZENIO at the next lower dose [see Dosage and Administration (2.2)]. Neutropenia occurred in 41% of patients receiving VERZENIO plus an aromatase inhibitor in MONARCH 3, 46% of patients receiving VERZENIO plus fulvestrant in MONARCH 2, and 37% of patients receiving VERZENIO alone in MONARCH 1. A Grade ≥3 decrease in neutrophil count (based on laboratory findings) occurred in 22% of patients receiving VERZENIO plus an aromatase inhibitor in MONARCH 3, 32% of patients receiving VERZENIO plus fulvestrant in MONARCH 2, and in 27% of patients receiving VERZENIO in MONARCH 1. In MONARCH 3, the median time to first episode of Grade ≥3 neutropenia was 33 days, and in MONARCH 2 and MONARCH 1 was 29 days. In MONARCH 3, median duration of Grade ≥3 neutropenia was 11 days, and for MONARCH 2 and MONARCH 1 was 15 days [see Adverse Reactions (6.1)]. Monitor complete blood counts prior to the start of VERZENIO therapy, every 2 weeks for the first 2 months, monthly for the next 2 months, and as clinically indicated. Dose interruption, dose reduction, or delay in starting treatment cycles is recommended for patients who develop Grade 3 or 4 neutropenia [see Dosage and Administration (2.2)]. Febrile neutropenia has been reported in <1% of patients exposed to VERZENIO in the MONARCH studies. Two deaths due to neutropenic sepsis were observed in MONARCH 2. Inform patients to promptly report any episodes of fever to their healthcare provider [see Patient Counseling Information (17)]. In MONARCH 3, Grade ≥3 increases in ALT (6% versus 2%) and AST (3% versus 1%) were reported in the VERZENIO and placebo arms, respectively. In MONARCH 2, Grade ≥3 increases in ALT (4% versus 2%) and AST (2% versus 3%) were reported in the VERZENIO and placebo arms, respectively. In MONARCH 3, for patients receiving VERZENIO plus an aromatase inhibitor with Grade ≥3 ALT increased, median time to onset was 61 days, and median time to resolution to Grade <3 was 14 days. In MONARCH 2, for patients receiving VERZENIO plus fulvestrant with Grade ≥3 ALT increased, median time to onset was 57 days, and median time to resolution to Grade <3 was 14 days. In MONARCH 3, for patients receiving VERZENIO plus an aromatase inhibitor with Grade ≥3 AST increased, median time to onset was 71 days, and median time to resolution was 15 days. In MONARCH 2, for patients receiving VERZENIO plus fulvestrant with Grade ≥3 AST increased, median time to onset was 185 days, and median time to resolution was 13 days. Monitor liver function tests (LFTs) prior to the start of VERZENIO therapy, every 2 weeks for the first 2 months, monthly for the next 2 months, and as clinically indicated. Dose interruption, dose reduction, dose discontinuation, or delay in starting treatment cycles is recommended for patients who develop persistent or recurrent Grade 2, or Grade 3 or 4, hepatic transaminase elevation [see Dosage and Administration (2.2)]. In MONARCH 3, venous thromboembolic events were reported in 5% of patients treated with VERZENIO plus an aromatase inhibitor as compared to 0.6% of patients treated with an aromatase inhibitor plus placebo. In MONARCH 2, venous thromboembolic events were reported in 5% of patients treated with VERZENIO plus fulvestrant as compared to 0.9% of patients treated with fulvestrant plus placebo. Venous thromboembolic events included deep vein thrombosis, pulmonary embolism, pelvic venous thrombosis, cerebral venous sinus thrombosis, subclavian and axillary vein thrombosis, and inferior vena cava thrombosis. Across the clinical development program, deaths due to venous thromboembolism have been reported. Monitor patients for signs and symptoms of venous thrombosis and pulmonary embolism and treat as medically appropriate. Based on findings from animal studies and the mechanism of action, VERZENIO can cause fetal harm when administered to a pregnant woman. In animal reproduction studies, administration of abemaciclib to pregnant rats during the period of organogenesis caused teratogenicity and decreased fetal weight at maternal exposures that were similar to the human clinical exposure based on area under the curve (AUC) at the maximum recommended human dose. Advise pregnant women of the potential risk to a fetus. Advise females of reproductive potential to use effective contraception during treatment with VERZENIO and for at least 3 weeks after the last dose [see Use in Specific Populations (8.1, 8.3) and Clinical Pharmacology (12.1)]. Diarrhea [see Warnings and Precautions (5.1)]. Neutropenia [see Warnings and Precautions (5.2)]. The safety and effectiveness of VERZENIO have not been established in pediatric patients. Of the 900 patients who received VERZENIO in MONARCH 1, MONARCH 2, and MONARCH 3, 38% were 65 years of age or older and 10% were 75 years of age or older. The most common adverse reactions (≥5%) Grade 3 or 4 in patients ≥65 years of age across MONARCH 1, 2, and 3 were neutropenia, diarrhea, fatigue, nausea, dehydration, leukopenia, anemia, infections, and ALT increased. No overall differences in safety or effectiveness of VERZENIO were observed between these patients and younger patients. No dosage adjustment is required for patients with mild or moderate renal impairment (CLcr ≥30-89 mL/min, estimated by Cockcroft-Gault [C-G]). The pharmacokinetics of abemaciclib in patients with severe renal impairment (CLcr <30 mL/min, C-G), end stage renal disease, or in patients on dialysis is unknown [see Clinical Pharmacology (12.3)]. No dosage adjustments are necessary in patients with mild or moderate hepatic impairment (Child-Pugh A or B). Reduce the dosing frequency when administering VERZENIO to patients with severe hepatic impairment (Child-Pugh C) [see Dosage and Administration (2.2) and Clinical Pharmacology (12.3)]. There is no known antidote for VERZENIO. The treatment of overdose of VERZENIO should consist of general supportive measures. Abemaciclib is a kinase inhibitor for oral administration. It is a white to yellow powder with the empirical formula C27H32F2N8 and a molecular weight 506.59. VERZENIO (abemaciclib) tablets are provided as immediate-release oval white, beige, or yellow tablets. Inactive ingredients are as follows: Excipients—microcrystalline cellulose 102, microcrystalline cellulose 101, lactose monohydrate, croscarmellose sodium, sodium stearyl fumarate, silicon dioxide. Color mixture ingredients—polyvinyl alcohol, titanium dioxide, polyethylene glycol, talc, iron oxide yellow, and iron oxide red. Abemaciclib is an inhibitor of cyclin-dependent kinases 4 and 6 (CDK4 and CDK6). These kinases are activated upon binding to D-cyclins. In estrogen receptor-positive (ER+) breast cancer cell lines, cyclin D1 and CDK4/6 promote phosphorylation of the retinoblastoma protein (Rb), cell cycle progression, and cell proliferation. In vitro, continuous exposure to abemaciclib inhibited Rb phosphorylation and blocked progression from G1 into S phase of the cell cycle, resulting in senescence and apoptosis. In breast cancer xenograft models, abemaciclib dosed daily without interruption as a single agent or in combination with antiestrogens resulted in reduction of tumor size. The pharmacokinetics of abemaciclib were characterized in patients with solid tumors, including metastatic breast cancer, and in healthy subjects. Following single and repeated twice daily dosing of 50 mg (0.3 times the approved recommended 150 mg dosage) to 200 mg of abemaciclib, the increase in plasma exposure (AUC) and Cmax was approximately dose proportional. Steady state was achieved within 5 days following repeated twice daily dosing, and the estimated geometric mean accumulation ratio was 2.3 (50% CV) and 3.2 (59% CV) based on Cmax and AUC, respectively. Carcinogenicity studies have not been conducted with abemaciclib. Abemaciclib and its active human metabolites M2 and M20 were not mutagenic in a bacterial reverse mutation (Ames) assay or clastogenic in an in vitro chromosomal aberration assay in Chinese hamster ovary cells or human peripheral blood lymphocytes. Abemaciclib was not clastogenic in an in vivo rat bone marrow micronucleus assay. Studies to assess the effects of abemaciclib on fertility have not been performed. In repeat-dose toxicity studies up to 3-months duration, abemaciclib-related findings in the testis, epididymis, prostate, and seminal vesicle at doses ≥10 mg/kg/day in rats and ≥0.3 mg/kg/day in dogs included decreased organ weights, intratubular cellular debris, hypospermia, tubular dilatation, atrophy, and degeneration/necrosis. These doses in rats and dogs resulted in approximately 2 and 0.02 times, respectively, the exposure (AUC) in humans at the maximum recommended human dose. VERZENIO 50 mg tablets are oval beige tablet with “Lilly” debossed on one side and “50” on the other side. VERZENIO 100 mg tablet are oval white to practically white tablet with “Lilly” debossed on one side and “100” on the other side. VERZENIO 150 mg tablets are oval yellow tablet with “Lilly” debossed on one side and “150” on the other side. VERZENIO 200 mg tablets are oval beige tablet with “Lilly” debossed on one side and “200” on the other side. Advise patients to read the FDA-approved Patient Information. If you have any loose stools, right away tell your healthcare provider, start taking an antidiarrheal medicine (such as loperamide), and drink more fluids. See “What are the possible side effects of VERZENIO?” for more information about side effects.What is VERZENIO?VERZENIO is a prescription medicine used:in combination with an aromatase inhibitor as initial hormonal therapy to treat women who have gone through menopause (postmenopausal) with hormone receptor (HR)-positive, human epidermal growth factor receptor 2 (HER2)-negative advanced breast cancer or breast cancer that has spread to other parts of the body (metastatic breast cancer). In combination with fulvestrant to treat women with hormone receptor (HR)-positive, human epidermal growth factor receptor 2 (HER2)-negative advanced breast cancer or metastatic breast cancer, whose disease has progressed after hormonal therapy. Alone to treat adults with HR-positive, HER2-negative advanced breast cancer or metastatic breast cancer whose disease has progressed after hormonal therapy and prior chemotherapy.It is not known if VERZENIO is safe and effective in children. Before taking VERZENIO, tell your healthcare provider about all of your medical conditions, including if you:have fever, chills, or any other signs of an infection. If you are able to become pregnant, your healthcare provider may do a pregnancy test before you start treatment with VERZENIO. Females who are able to become pregnant should use effective birth control during treatment with VERZENIO and for at least 3 weeks after the last dose of VERZENIO. Talk to your healthcare provider about birth control methods to prevent pregnancy during treatment with VERZENIO. If you become pregnant or think you may be pregnant, tell your healthcare provider right away. Are breastfeeding or plan to breastfeed. It is not known if VERZENIO passes into your breast milk. Do not breastfeed during treatment with VERZENIO and for at least 3 weeks after the last dose of VERZENIO. Tell your healthcare provider about all the medicines you take, including prescription and over-the-counter medicines, vitamins, and herbal supplements. Certain other medicines can affect how VERZENIO works and cause serious side effects.Especially tell your healthcare provider if you take a medicine that contains ketoconazole.Know the medicines you take. Keep a list of them to show your healthcare provider or pharmacist when you get a new medicine. How should I take VERZENIO?Take VERZENIO exactly as your healthcare provider tells you. Your healthcare provider may change your dose if needed. Do not stop taking VERZENIO or change the dose without talking to your healthcare provider. VERZENIO may be taken with or without food. Swallow VERZENIO tablets whole. Do not chew, crush, or split the tablets before swallowing. Do not take VERZENIO tablets if they are broken, cracked, or damaged. Take your doses of VERZENIO at about the same time every day. If you vomit or miss a dose of VERZENIO, take your next dose at your regular time. Do not take 2 doses of VERZENIO at the same time to make up for the missed dose. If you take too much VERZENIO, call your healthcare provider or go to the nearest hospital emergency room right away. What should I avoid during treatment with VERZENIO?Avoid taking ketoconazole during treatment with VERZENIO. Tell your healthcare provider if you take a medicine that contains ketoconazole. Avoid grapefruit and products that contain grapefruit during treatment with VERZENIO. Grapefruit may increase the amount of VERZENIO in your blood. VERZENIO may cause fertility problems in males. This may affect your ability to father a child. Talk to your healthcare provider if this is a concern for you.These are not all the possible side effects of VERZENIO. For more information, ask your healthcare provider or pharmacist.Call your healthcare provider for medical advice about side effects. You may report side effects to FDA at 1-800-FDA-1088. How should I store VERZENIO?Store VERZENIO at room temperature between 68°F to 77°F (20°C to 25°C).Keep VERZENIO and all medicines out of the reach of children.General information about the safe and effective use of VERZENIOMedicines are sometimes prescribed for purposes other than those listed in a Patient Information leaflet. Do not use VERZENIO for a condition for which it was not prescribed. Do not give VERZENIO to other people, even if they have the same symptoms you have. It may harm them. You can ask your pharmacist or healthcare provider for more information about VERZENIO that is written for health professionals. What are the ingredients in VERZENIO?Active ingredient: abemaciclibInactive ingredients: microcrystalline cellulose 102, microcrystalline cellulose 101, lactose monohydrate, croscarmellose sodium, sodium stearyl fumarate, silicon dioxide.Color mixture ingredients: polyvinyl alcohol, titanium dioxide, polyethylene glycol, talc, iron oxide yellow, and iron oxide red. Marketed by: Lilly USA, LLC, Indianapolis, IN 46285, USACopyright © 2017, 2018, Eli Lilly and Company. All rights reserved.VER-0002-PPI-20180226For more information, go to www.verzenio.com or call 1-800-545-5979.